The Royal couple started their day by playing cricket with none other than the God of Cricket Sachin Tendulkar in a park in Mumbai. Without much hype coming up, the duo made their entry, and they have been accompanied by Sachin Tendulkar and Dilip Vengsarkar at the Oval Maidan Recreation ground. The duo has been seen batting with a lot of energy, and they cheered up the crowds. They even posed for photographs during their visit, and they spent enough time despite the huge heat all over. The couple visited the ancient Banganga water tank in the city where they have been greeted by dancers with garlands. They have been informed about the terrible fire accident in Kollam, Kerala in which 106 people lost their lives. Saddened by the news, the royal couple sent their message to the victims. It was then, the couple attended the Bollywood gala which has been graced by all the top Indian film actors which have been arranged to raise massive funds for charities. The event was graced by Shah Rukh Khan, Madhuri Dixit, Aishwarya Rai Bachchan, Parineeti Chopra, Huma Qureshi, Farhan Akhtar, Rishi Kapoor, Neetu Kapoor, Anil Kapoor, Karan Johar, Anil Kapoor, Alia Bhatt, Aditi Rao Hydari, Sonam Kapoor, Jacqueline Fernandez, Kanika Kapoor, Sophie Chowdhary, Arjun Kapoor, and Manish Malhotra. All the Bollywood celebrities lined up to shake hands with the royal couple during the evening which took place at The Taj Mahal Palace, Mumbai. The event has been described as one of the costliest one in the recent times in the country. 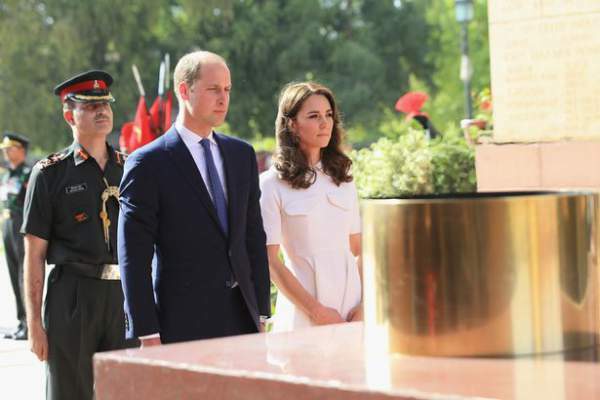 Along with these, The British King Prince William and his wife Kate Middleton will also meet Prime Minister Narendra Modi in New Delhi on Tuesday along with Kaziranga National Park situated in Assam. The couple will then move to Bhutan after which they will head back to visit the Taj Mahal in Agra. Their tour has been entirely managed under high security revealed a source from the Prime Minister’s office.